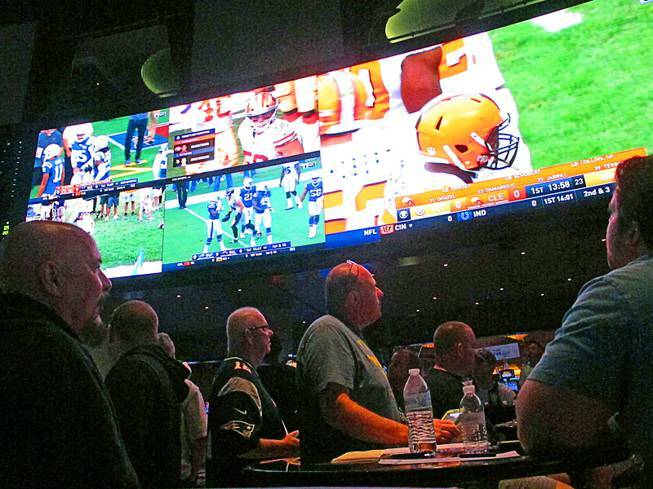 In this Sept. 9, 2018 photo, customers watch an NFL game in the sports betting lounge at the Ocean Resort Casino in Atlantic City, N.J. Figures released Sept. 12 by state gambling regulators show that New Jersey gamblers plunked down more than $95 million on sporting events, more than twice as much as a month earlier. Friday, Sept. 14, 2018 | 12:15 a.m.
ATLANTIC CITY, N.J. — One of the world’s largest online gambling companies has launched mobile sports betting in New Jersey, the latest to do so in the rapidly expanding market. “As one of the largest online gaming companies in the world with millions of customers worldwide, we have successfully launched BetStars in regulated markets across Europe and look forward to expanding and enhancing our New Jersey BetStars offering,” said Matt Primeaux, the company’s senior vice president for U.S. strategy and operations. New Jersey’s sports betting market is growing rapidly. Since it began in June, gamblers have plunked down more than $152 million on sporting events.